Mary Arnold receives help from Kayla Horn (WCPL) during a recent computer clinic. Computer clinic is offered the first and last Wednesday of each month. WARSAW — Imagine you’re on the beach, relaxing in the sun, with splashes of ocean water lapping at your feet. The temperature is perfect, and you have no worries. What could possibly make this scene even better? What about if you had a great book to read? But you forgot a book – oh no! Never fear! Did you know that you can check out library eBooks and eAudiobooks on your phone or tablet anywhere you have an internet connection, even on vacation? Warsaw Community Public Library subscribes to two main eBook and eAudiobook collections: Overdrive and One Click Digital. While Overdrive carries both eBooks and eAudiobooks, One Click Digital only carries eAudiobooks. Both services have thousands of titles to choose from, and both are completely free for library patrons with active cards. Books can be checked out for up to three weeks, with renewals available for most titles. You can also check out up to 10 books at a time – and books can be returned early if you finish them and want to check out more. To check out library books from these collections, all you need to do is download the app for whichever service you want, and then log in using your library card number. EBooks and eAudiobooks can even be downloaded prior to a vacation and read without an internet connection if you are headed somewhere with no service. If you have an eReader or device that doesn’t support apps, you can check out materials with those too. Start by visiting the Warsaw Community Public Library’s webpage here and then checkout eBooks and transfer them to your eReader through your normal methods on the computer. If checking out eBooks seems confusing or complicated or you need more information, come in to the library and pick up a free step-by-step handout to show you how to download eBooks to your device. Bring in your device, and one of the friendly librarians at the Adult Reference desk can help you set up your account. 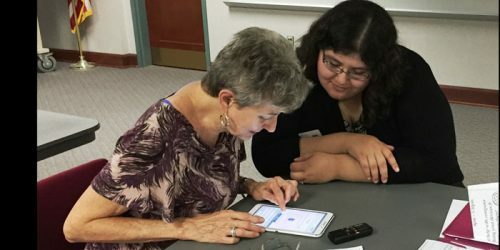 The Warsaw Community Public Library also hosts a computer clinic the first Wednesday of every month from 10 a.m. to 11:30 a.m. and last Wednesday of every month at 4 p.m. to 5:30 p.m. This is a perfect opportunity to bring your phone or table tot learn more about the library’s eBooks! Don’t be stranded this summer with nothing to read – read free library eBooks anytime, anywhere!